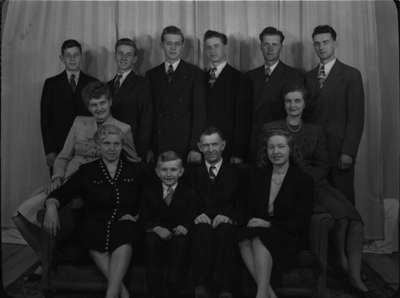 A black and white photograph of the Ottenbrite family. Joseph George Ottenbrite (1893-1988) and Teresa M. Nagel (1899-1981) married in 1916 and had 10 children (Jean, Gertrude, Josephine, Joseph, James, Clement Frederick, Wilfred, Peter, George and Ray). Joseph G. Ottenbrite operated a cleaning and pressing business at 114 Brock Street North. He also made suits to order and did alterations and repair work. Ottenbrite Family, 1947, Marjorie Ruddy. Whitby Archives A2013_040_1272.